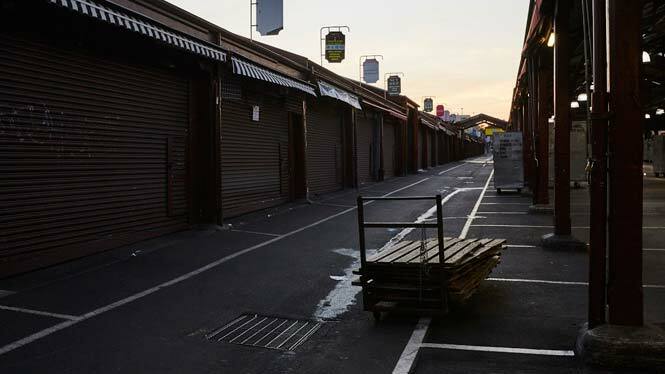 Queen Victoria Market (QVM) was the site for the inaugural Public Art Melbourne Biennial Lab: What happens now? and the Lab's temporary art commissions. QVM has long been a meeting place. It was a gathering place first for the clans of the Kulin Nation, then for mourners and families in remembrance of passed loved ones, for the ‘suburban swagmen’ of late 1880s Melbourne, for market gardeners, customers, and the community. Market gardening and trading afforded opportunities for old and new arrivals to begin a new life and call Melbourne home. It also served as a platform for racketeers to embark in price fixing and extortion scandals. In the late 1880s, the Market was considered to be on the fringe of society, both geographically and socially. It was not bound to the same rules and structures of other public spaces within Melbourne CBD proper. QVM is a place where happenstance was embraced, and language was, and still is, no barrier. Established in 1878, as part of Melbourne City Council’s mandate to manage Melbourne’s consortium of markets, the Queen Victoria Market offers a place and site to re-imagine the traces of Aboriginal, economic, migratory, social and colonial histories. These histories are embedded in the site and extend into the streets of Melbourne and regional Victoria and the descendants of the history-makers. QVM is an iconic part of Melbourne, cherished by many people. Situated on the northern boundary of Melbourne’s CBD grid, the Lower Market is located on one of Melbourne’s principal north/south streets, Elizabeth Street. The Meat Hall entrance faces the intersection of Elizabeth, Victoria and Leicester Streets; a location that was once a swamp formed by the merging of two waterways that flowed down, where Elizabeth Street now lies, into the Yarra River. The Upper Market resides on Melbourne’s first official cemetery site, positioned on the edge of what was colloquially known as Burial Hill. QVM is characterised by its sounds, smells, and bustling atmosphere. On trading days, forklifts and trucks deliver and dismantle the daily trade, the sounds of which are punctuated by spruikers’ shouts throughout the sheds and halls. In the Lower Market, the smell of seafood permeates the air of the adjacent laneways, and freshly brewed coffee lingers in the nearby Dairy Hall. Shoppers and tourists stroll down the seemingly endless rows of product stalls and vie for the best seasonal produce and wares of all sorts. Architecturally, the market halls are formed by a grid of pillars intersected by junctions of pathways and roads. Typically, the activity of the Market is defined by public interaction within trading hours. However, much of QVM’s activity occurs outside these hours – including the daily preparations for trading, and the relationships with wholesale markets and regional growers. 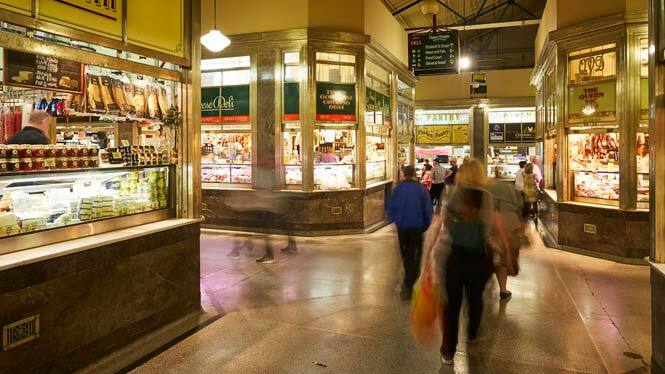 Today, QVM is about to transition into the first stages of the City of Melbourne’s plan to preserve and renew the Queen Victoria Market, creating an expanded market precinct. The City of Melbourne Participate website and the QVM Precinct Renewal website are helpful resources that outline what is intended.